Rami, hats off to you. ‘The man in the Cube’ is a project organized by The League of Independent Activists – IndyACT aiming to raise global urgency on the critical dangers of global warming and to urge world leaders to take fast and effective action against climate change in Copenhagen this year. ‘The man in the cube’ (Rami Eid) represents “the last man on earth” enduring a fierce struggle for survival against climate change effects. 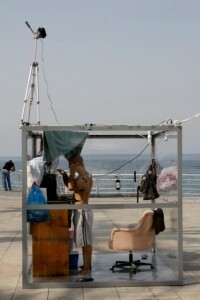 He will be living in a transparent 4 meter square cube on Ein El-Mreyseh in Beirut, Lebanon, for 3 days starting October 16th, 2009. The ‘last man’ simulates the possibility of a dim future for mankind where we failed to act against climate change when we had the chance. Follow the man in the cube on twitter and his personal blog. Posted: October 17th, 2009 under News. Save yourself by saving the earth. After all, it’s about YOU, and it starts by YOU! Posted: October 15th, 2009 under Cultural, Thoughts. 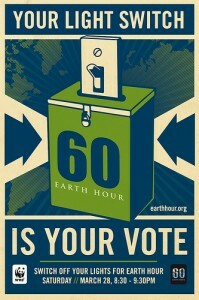 For those of you who do not know, earth hour is scheduled for today from 8:30 pm till 9:30 pm local time. Earth Hour is an international event organized by the WWF (World Wildlife Fund), and held on the last Saturday of March each year, which asks households and businesses to turn off their non-essential lights and electrical appliances for one hour to raise awareness towards the need to take action on climate change. Earth Hour began in Sydney in 2007, when 2.2 million homes and businesses switched off their lights for one hour. In 2008 the message had grown into a global sustainability movement, with 50 million people switching off their lights. Global landmarks such as the Golden Gate Bridge in San Francisco, Rome’s Colosseum, the Sydney Opera House and the Coca Cola billboard in Times Square all stood in darkness. Even Google’s homepage went “dark” on the day Earth Hour took place. Earth will still be here, maybe having a different living environment that is not suitable for us as human beings, but it is us who will disappear! I believe all these ads about saving earth should be modified, to reflect the fact that we are saving ourselves! Maybe this would lead to a higher awareness in the consciousness of people. As for me, I am doing my part in this global campaign, as should each one of you. Posted: March 28th, 2009 under News, Thoughts.